Arthroscopic Bristow – Latarjet Procedure: Results and Technique after nine-year experience. Acta of Shoulder and Elbow Surgery | Volume 1 | Issue 1 | Oct-Dec 2016 | Page 27-34 | Jose Carlos Garcia Jr.
Introduction: The Bristow procedure is an established and effective method to treat anterior shoulder instability. Following the current trend towards minimally invasive procedures, we performed the Bristow technique arthroscopically and assessed the results. Materials and Methods: This study enrolled 33 patients with more than 2 years of follow-up. We assessed the UCLA score before and after surgery and completed post-surgical assessments of the Rowe score, Simple Shoulder Test (SST) score, and differences in external rotation (DER) at follow-up approximately 2 years or more post-surgery. Results: At the 2-year follow-up, the average UCLA score increased from 25.48±0.64 (SD 3.67) pre-surgery to 33.03±0.57 (SD 3.26) (p<0.0001). In addition, the mean Rowe score was 93.33±2.00 (SD 10.93; compared with the cutoff score of 75, p<0.0001), the mean SST score was 11.20±0.28 (SD 1.52), and the mean DER was 11.50±1.65 (SD 9.02). No recurrences of instability or musculocutaneous nerve lesions occurred in the patients. Conclusion: Together, the UCLA score, SST score, DER, Rowe score and the recurrence rate suggest that the arthroscopic Bristow procedure was effective in treating anterior shoulder instability with short-term follow-up. However, although these results are encouraging, this procedure is not free of complications. Additional data and prospective trials are important to better understand the possible advantages and disadvantages of this procedure. Keywords: Latarjet, Bristow, shoulder instability, shoulder dislocation, arthroscopy, arthroscopic. Anterior shoulder instability is one of the most common pathologies of the shoulder . Among the many surgical techniques available to treat anterior shoulder instability, one of the most effective and well known techniques is the transfer of the coracoid and conjoined tendon to the anterior glenoid rim . This procedure was suspected to be originally performed by Walter Rowley Bristow for the surgical treatment of recurrent anterior shoulder instability before 1929 ; however, no details on the surgical technique were reported until the Helfet report in 1958 over the technique he learnt in 1939 from Bristow . In 1954, Michel Latarjet established the modern concept of this surgery using one screw to fix the coracoid and splitting the subscapularis in the horizontal direction . Didier Patte et al. disseminated this technique throughout Europe in the 1980s and used two 4.5 mm screws to fix the graft . This procedure involving the transfer of the coracoid and conjoined tendon to the anterior glenoid rim has been modified several times, but these modifications have always respected the principles established by Bristow and Latarjet . Many of these modifications have resulted in successful results with some common complications. The most common complications include loss of external rotation, osteoarthritis, pain, Musculocutaneous nerve lesions and non-unions . These complications have led many surgeons to avoid this procedure and prefer capsular plication with labral reconstruction. Recently, minimally invasive arthroscopic techniques have been developed to perform Latarjet surgery [14 ].Through an intra-articular view, the surgeon is able to better position the graft and avoid some of the possible complications related to positioning, such as recurrence of dislocation and osteoarthritis. The intra-articular view of the insertion site also ensures the presence of bone marrow at the contact area, which allows for a more reliable osteosynthesis [1,14,17]. However, this new approach to the established procedure requires new instruments and increased surgical costs. In 2009, a surgical technique was created to allow the Bristow procedure to be performed with a minimally invasive procedure that uses regular arthroscopic devices and one screw . In this study, we have modified this technique and present the results of 33 patients who underwent the arthroscopic Bristow procedure to treat anterior shoulder instability. Hypothesis: This new modification of the arthroscopic Bristow procedure, which utilizes regular arthroscopic devices, is an effective procedure to treat patients with anterior shoulder instability. Purpose: To assess the effectiveness and safety of the modified arthroscopic Bristow procedure. This prospective case series study Stage 2a of the IDEAL-Collaboration. From September 2007 to September 2016, 47 patients underwent arthroscopic Bristow-Latarjet procedure. Of these 47 patients, the first three surgeries were not scored before the surgery and were therefore not allowed to take part of this trial. The records of two other patients were lost, one successfully returned to his high impact activities, and the records of the other present just the pictures of his recovered arch of motion. Nine patients present less than two years post surgery. The remaining 33 patients fulfilled the inclusion and exclusion criteria as described in Table 1. Elevation: The final range of motion was compared to the contralateral side if differences in elevation were greater than 10º; and Dislocation recurrence. Assessments: Patients were assessed at baseline for external rotation in adduction of the affected shoulder and UCLA score. Patients were assessed two years post-surgery for external rotation in adduction of the affected shoulder, shoulder elevation, Rowe score, SST score and UCLA score. Post-surgical assessments also included roentgenograms at two weeks, five weeks and two years after surgery. Computed tomography (CT) scans were also performed when complications were suspected. Statistical analyses were performed using Prism6®for Mac (GraphPad Software Inc.). All data were tested for normality using the D’Agostino and Person test, Shapiro-Wilk test and KS test. Thereafter, the data were assessed according to patient characteristics. The intention to treat (ITT)  principle was used whenever possible. Interim sample size was calculated to determine whether the study achieved significance and statistical power as an adaptive design. For all possible assessments, a two-tailed test of significance was used, and p<0.05 was considered statistically significant. Adverse events or complications are reported for all the 33 patients enrolled in the study. In addition, the causes for withdrawal from the study are also reported. Under general anesthesia, the patient was placed in the beach chair position with their arms free. A standard posterior portal was established, and the arthroscope was introduced. An arthroscopic pump with 40 mm Hg of pressure was used in the procedure. The patient’s blood pressure was not controlled during the procedure, except in cases of very high blood pressure that could potentially compromise the surgery. Diagnostic arthroscopy was performed, and a portal was placed under the anterior triangle, through the subscapularis. This anterior modified portal was inferior and medial to the traditional anterior portal. The location for the portal could be found using a needle, which was inserted where the surgeon planned to insert the screw. If the surgeon was troubled by the axillary nerve, nerve integrity could be confirmed through arthroscopic visualization using an arthroscope inserted into the lateral portal. The musculocutaneous nerve could also be visualized using this technique. The arthroscope was returned to the posterior portal. After assessment of the joint and identification of the bony Perthes-Bankart lesion, the anterior glenoid rim was shaved. The rotator interval and coraco-clavicular ligaments were removed, and the lateral part of the coracoid was exposed using an electrocautery device. If necessary, a portion of the anterior capsule can be removed for better visualization. The subscapularis was opened in the same direction as its fibers with a Kelly device through the anterior modified portal. Caution should be taken when passing the device through the modified anterior portal, which is lateral to the conjoined tendon, to avoid nerve injuries. The electrocautery device can also be used at this point. The Kelly device was introduced through the anterior modified portal, and the subscapularis was opened from the bursal side to the articular side, which is similar to the open Bristow procedure. The tendon was opened wide in the middle of the tendon (Fig. 1). Although the axillary nerve is in close proximity, lesions to this nerve are not common, as in the open Bristow procedure . The anterior modified portal was used to introduce a 2.5 to 3.5 mm drill to the anterior glenoid defect at the location where the screw will be inserted and at the same axis as the glenoid through the subscapularis split. This procedure was performed under direct view using the arthroscope in lateral portal and the drill perpendicular to the shaved anterior glenoid rim. The hole needs to be at least 5-6 mm medial to the glenoid rim and inferior the humeral head equator to avoid redislocation  . A guide should be used for the drill to avoid nerve injuries. The Glenoid Bone Loss Instrument Set from Arthrex® (Naples-Fl-USA) (Fig. 2) contains a guide that can be used to make this step safer. However, in the majority of the procedures performed in this study, we only protected the skin, deltoid and conjoined tendon because direct visualization showed that the drill was at a safe distance from the neurovascular structures. Sometimes the conjoined tendon can be medialized by the guide to enable an optimal position. 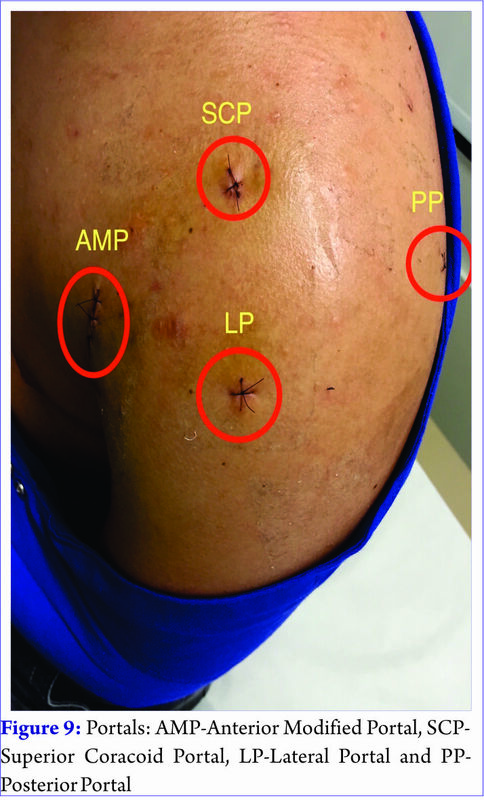 The subscapularis is not affected during the drilling because of the saline solution used in arthroscopy. The 2.5 to 3.5 mm (depending on the coracoid diameter) drill was inserted until the posterior scapula cortical was felt. The distance from the hole to the glenoid rim was approximately 5 to 6 mm,29 which was measured using a probe and a surgical ruler. If the coracoid length is larger in the horizontal axis than the vertical axis, small corrections can be made by rotating the graft. Then, a second drill of equal size was placed beside the first one to compare and measure the difference in length between the two drills. This second drill is not inserted and no extra hole is made; the drill is only placed besides the other drill to measure the length. This measurement represents the glenoid length, and small differences in this measurement are expected. The arthroscope was then reinserted into the lateral portal. To find the best portal for the osteotomy, an 18-gauge needle was used, which was inserted lateral to the coracoid and located near the clavicle. Direct visualization using the arthroscope is optimal to determine the most adequate point to insert the osteotome. This portal can also be used to access the superior tip of the coracoid (superior coracoid portal-SCP). The pectoralis minor and the facia were detached through this portal using electrocautery. A small nitrogen saw was inserted through this portal, and the coracoid was carefully cut. A regular osteotome can also be used for this purpose. The direction of the osteotomy is vertical to the coracoid. The risk of breaking the bone is avoided by using a nitrogen saw. The coracoid and the conjoined tendon were pulled out of the body using a Kocher device through the anterior portal (Fig. 3). Any irregularity of the coracoid graft was flattened to improve the contact surface. A hole was made in the coracoid using a 2.5 to 3.5 mm drill in the horizontal axis. The coracoid length was then measured. However, if the surgeon’s preference is to use the vertical coracoid axis, he/she will also have to drill the inferior part of the coracoid to optimize bone healing and create an extra portal to insert the screw. The best location for this additional portal is just above the coracoid at the location where the screw will be inserted. This location can be better defined using a needle under direct arthroscopic visualization and is located near the clavicle. The use of the vertical position for the coracoid without exteriorization is recommended in heavy and extremely strong patients, where exteriorization is very difficult. We have performed this modification of the procedure when necessary (Fig. 4). However, exteriorization of the coracoid makes the procedure faster and easier, and the length of the anterior portal is not modified. The size of the anterior portal is the same size as the diameter of the coracoid (10-14 mm), as measured intraoperatively using a surgical ruler. This procedure of measuring clearly defines the length of the glenoid and coracoid, and the sum of the two is the exact length of the malleolar screw to be used. A 3.5 to 4.5mm mm malleolar screw was then inserted in the coracoid (Fig. 5). Most commonly, a 34 to 40 mm sized screw is used. For fixation, the arthroscope was reinserted in the posterior portal, and the coracoid plus the conjoined tendon were inserted through the split subscapularis tendon. A Kocher device and a probe are used to make this procedure easier. The screw was inserted into the anterior glenoid rim, and fixation was achieved with the graft in the horizontal position. Often the hole is not easy to locate; therefore, the arthroscope needs to be inserted in the SCP and the lateral portal to improve visualization. The screwdriver can be used as a joystick by using traction of the screw against the screwdriver with a synthetic multifilament number 5 polyester wire. A Kocher device can be inserted in the SCP to avoid the rotation of the coracoid while the screw is fixed(Fig. 6). If the graft is overhanging, sometimes a small rotation of the graft can be enough to correct this problem once the coracoid is more elliptical than circumferential. However, if the graft remains impinging on the humeral head, it can also be shaped using an osseous shaver. Finally, shoulder external rotation was checked using the arthroscope in the posterior portal (Fig. 7). A radiographic exam was also performed (Fig. 8). The portals were closed using nylon 4.0 or 3.0 sutures (Fig. 9) The capsule was never repaired in this arthroscopic procedure; however, it can be performed if desired by the surgeon. Post-operative care is similar to that with the open Bristow procedure protocol. The patient will use a shoulder immobilizer during the first five weeks. Minimal movements, such as free elbow flexion and extension and hand and wrist movements, are recommended, and the patient is instructed to avoid external rotation of the shoulder.The patient is encouraged to start pendular movements (external rotation from 0º to 10º) and assisted passive elevation (up to 60º) only after the second week following surgery.External rotation is avoided for five weeks. The progression of external rotation and elevation is in consideration of the patient’s pain level. Gain of range of motion begins only five weeks after the surgery. Aggressive gain of range of motion begins just six weeks after the surgery. Active rotator cuff exercises are also allowed five weeks post-surgery. All sports can be performed after eight weeks; however, the patient may have poor external rotation at this time point, which may restrict the performance of some sports. Improvement in external rotation will occur approximately six months after surgery. Data loss: Of the 33 patients enrolled in this study, one died due to a car accident, one did not return for post-operative care, and another patient presented with a fracture to the coracoid, which required conjoined tendon tenodesis in the anterior glenoid rim. However, the data from these three patients were included in the study because UCLA baseline evaluations were obtained for these patients. Despite good results for pain, stability and function (UCLA=34), the patient who underwent the conjoined tendon tenodesis was graded postoperatively with the same baseline. Of the 33 patients included in the study, there were 32 males and 1 female with a mean age of 33.34 years (range: 18-60 years old). In total, 11 presented with anterior shoulder instability to the left side and 22 to the right side. The average follow-up time was 4.73 years (range 2-8 years). 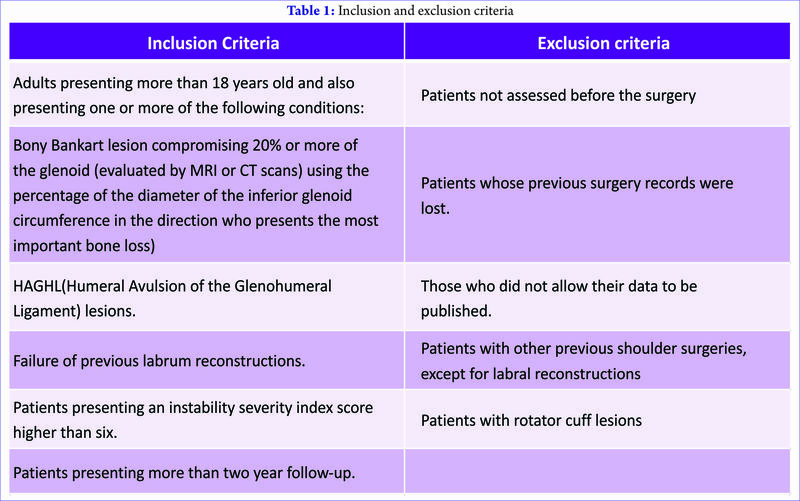 The reasons for performing the procedure included bony Bankart lesions compromising 20% or more of the glenoid (20 patients), HAGHL lesions (1), failure of previous labrum reconstructions (7) and an instability severity index score higher than six(5). UCLA was assessed in ITT (33 patients), and the results are summarized in Table 2. The Rowe score was assessed according to defined protocols (30 patients), and the results are summarized in Table 3. SST and DER were assessed according to defined protocols (30 patients), and the results are summarized in Table 4. The frequencies of SST responses are summarized in Table 5. There were no differences in elevation from the contralateral side of more than 10º, except in 2 cases. Internal rotation was not assessed; however, 9 of 30 patients presented with discomfort during this movement at the extremes of internal rotation, as assessed in question 11 of the SST. One was a complete fracture, and the surgeon successfully performed an anterior conjoined tendon tenodesis through the subscapularis split. The other fracture was a partial fracture, and the surgeon performed a coracoid cerclage and successfully completed the arthroscopic Bristow procedure. ii) Post-surgical complications (30 patients): Of the 33 patients enrolled in this study, one died due to a car accident, one did not return for post-operative care, and another patient presented with a fracture to the coracoid, which required conjoined tendon tenodesis of the anterior glenoid rim. a) Coracoid fractures: One patient was found to have a partial coracoid fracture; however, the remaining part of the coracoid was sufficient to avoid redislocation. b) Non-unions: There were no non-unions. c) Screw torsion: There were no screw torsions. d) Osteolysis: Osteolysis was assessed through an axillary roentgenogram and was present in three patients (10%), including two with no clinical repercussions, who refused screw removal, and one patient who underwent screw removal. e) Osteoarthritis: Osteoarthritis was assessed using a roentgenogram and was present in 2 patients. Both patients presented with moderate arthrosis according to the Samilson & Prieto classification , although one patient presented with moderate osteoarthritis before the surgical procedure. Both received follow-up more than 2 years following the surgery (one at 7 years and the other at 5 years). Infection: One patient contracted an infection more than 6 months post-surgery, which was the worst outcome observed. Anterior impingement: Anterior impingement was present in two patients, including the patients with osteolysis. Both patients underwent hardware removal. Subluxations: There were no subluxations reported. Instability recurrences: There were no instability recurrences. Sample size: An interim analysis13 was performed to confirm whether the sample size was suitable for analysis. We enrolled a total of 33 patients to provide data for the sample size calculation20 and determined that the number of individuals was sufficient to answer the research question with respect to an alpha and beta of <0.05. Given that the current trend is to use minimally invasive surgical procedures to reduce surgical trauma and scars, it seems logical to modify established procedures to this new approach. Recently, modifications of the Bristow and Latarjet procedure have been developed to allow the procedure to be performed arthroscopically [1,14,17]. There are several advantages to the use of an arthroscopic coracoid transfer procedure, including better visualization of the insertion area in the anterior glenoid rim, the possibility to correct the graft to avoid overhanging, testing external rotation under direct visualization, treatment of concomitant intraarticular lesions, and a reduction of scars and possibly post-operative pain. In addition, there are several disadvantages, such as higher costs, a steeper learning curve for the surgeon, and a need for specific training. However, in the author’s opinion, the above-listed advantages make arthroscopic modifications of the coracoid transfer procedure a reliable possibility for treating anterior shoulder instability. In this study, fracture of the coracoid was the main complication of this procedure (3 cases). Edwards and Walsh have stated that fracture of the coracoid can be avoided by using the 2-finger technique, which improves torque control.7 Another consideration is the size of the screw; in this procedure, a 3.5 to 4.0 mm screw is more suitable for avoiding fractures compared with a 4.5 mm screw. It is also important to mention that to externalize the coracoid, the surgeon can insert the Kocher device in the soft tissue of the conjoined tendon beside the coracoid, instead of in the graft, to avoid graft fractures. In fact, when considering these 3 points, we felt more confident with the procedure and did not observe any further breakage. Regarding the treatment of the fractures, in 1 case the fracture was not complete and was successfully treated using a synthetic multifilament number 5 polyester cerclage around the coracoid. The partial fracture occurred in the shoulder of the only female in the study and was possibly because the screw was too large (4.5 mm) for her coracoid. In the other case, the fracture was complete and occurred during the fixation step; therefore, we performed a conjoined tendon tenodesis in the anterior glenoid rim using suture anchors similar to the way the procedure was performed in the past by Bristow . The third patient did not require any further procedure. Studies have found no significant differences in cadaveric models when comparing coracoid transfer with conjoined tendon tenodesis only [25,28] .In addition, studies have shown that the coracoid transfer does not need to produce a bone-block effect . In fact, neither the original Bristow nor the original Latarjet procedure presented enough bone to produce a bone-block effect. In the original Bristow procedure, the tip of the coracoid is sutured to the anterior glenoid rim,11 whereas in the original Latarjet procedure, the coracoid graft size is small, which allows for the complete preservation of the pectorals minor insertion in the remaining coracoid . The bone-block effect of some modern variations of the Bristow and Latarjet procedures has added more stability to the original surgical procedures; however, this consideration may only be important for patients who present with Hill-Sachs lesions higher than the glenoid track . Moreover, the data remain inconsistent regarding the best screw diameter for coracoid transfers. Walsh and Boileau successfully performed the procedure using 4.5 mm malleolar screws ; Burkhed et al. and Di Giacomo et al. used 3.75 mm screws; and Lafosse et al. used 3.5 mm screws . The author’s personal experience is that screw size is dependent on the patient’s characteristics. For example, a 4.5 mm screw may be used for tall males; however, the most recommended size is 3.5 to 4.0 mm. Walsh and Boileau do not recommend using washers to avoid impingement . However, the use of small washers is recommended when using 3.5 to 4.0 mm screws to better distribute the pressure on the graft without adding impingement. In the arthroscopic Bristow procedure used in this study, osteolysis was found in 3 cases. In the author’s opinion, osteolysis caalso be associated with the high forces that the screw impose on the graft . However, assessments were performed only using X-rays, which is not the most sensitive method. One case of osteolysis was accompanied by impingement and required removal of the screw . The patient with impingement underwent surgery for hardware removal; however, 9 of 30 patients answered no to question 11 of the SST. This result indicates that these patients had difficulty washing the back of the opposite shoulder with the affected extremity. Therefore, impingement may be underestimated by patients, although the author accepts the impingement rate of 9/30 in this study, even if only reported for extreme movements. Because impingement can be linked to the angle of the screw and the graft, it is important to note that higher angles within the arthroscopic procedures should never be more than perpendicular to the glenoid’s border. This is because direct visualization allows the surgeon to have direct control over the position, which avoids overhanging but occasionally causes impingement or discomfort in extremes of internal rotation. Moreover, the author suggests that the size and the obliquity of the graft can influence anterior impingement and the effective glenoid depth  In this study, the reoperation rate was 6.67%, which was only for hardware removal and is similar to the 7% reported in the literature for the open Bristow procedure . Osteoarthritis was present in only 2 (6.67%) of the patient’s shoulders, and one of the two patients presented with osteoarthritis before the surgical procedure. This low rate may be associated to better graft positioning and less overhanging. However, the follow-up for assessing osteoarthritis was too small to emphasize these benefits. It is important to insert the coracoid graft in a flush position to avoid both an increase in edge loading and to shift contact pressure to the posterosuperior quadrant of the glenoid . To date, no post-surgical recurrences of instability have occurred; however, the follow-up time may be insufficient to make conclusions regarding this outcome. Regarding the graft position, studies have suggested that a medial deviation of the coracoid of 5 mm or more is associated with a higher failure rate . Therefore, graft positioning may be one advantage of the arthroscopic procedure.In this study, no non-unions were found. This result may be due to better exposure of the marrowbone of the anterior glenoid rim, better visualization during fixation to avoid interpositions and the author’s preference for the horizontal position of the graft. This position allows the biological union of the graft’s marrowbone with the glenoid rim’s marrowbone. However, follow-up assessments were performed only using X-ray, which is not the most sensitive method to detect non-unions. The author believes that one screw is sufficient to fix the coracoid. In Hovelius’ report on the Bristow procedure, he reported 16 redislocations within a sample of 319 shoulders, which included 5% that underwent the Bristow procedure using only 1 screw. Of those patients, 13% presented with a non-union; however, the fibrous union did not affect the recurrence rate, and only 3 patients underwent revision surgery because of the remaining instability . According to Hovelius, the recurrence of instability is linked to medialization of the coracoid graft . Our low rate of recurrence may be due to improved visualization during insertion of the graft; however, the small sample size of our study and the short follow-up period prevent us from confirming this notion. Similar redislocation rates (4%) to those reported by Hovelius were recently reported by Burkhart et al. in 102 patients , and Collin et al. in 74 patients , and both reports used 2 screws for fixation (Latarjet). The musculocutaneous nerve was the most common nerve injury and was reported in 0.6% of all surgical procedures . The author did not find any nerve dysfunction or lesions; however, similar low rates of nerve compromise have been reported in the literature, and further studies are necessary to suggest any conclusions on nerve safety. The procedure presented in this study uses regular arthroscopic devices and screws, which provides significant cost advantages. The learning curve for this procedure requires specific and extensive training. The high rates of coracoid fractures were overestimated because not all of the procedures used the 2-finger technique and smaller screw sizes. The study was not a comparative study; therefore, comparing other techniques to the technique described in this study was not possible. The follow-up for osteoarthritis assessment was short. Future assessments will make these data more suitable for analysis. The UCLA score, SST score, DER, Rowe score and the recurrence rate reported herein suggest that the arthroscopic Bristow procedure is effective in treating anterior shoulder instability with short-term follow-up. However, although these results are encouraging, this procedure is not free of complications. Additional data and more prospective trials are important to better understand the possible advantages and disadvantages of this procedure. In particular, multicenter studies are needed to confirm the effectiveness and safety of this procedure, and new devices are needed to improve the accuracy and ease of using this procedure to treat anterior shoulder instability. 1. Boileau P, Bicknell RT, El Fegoun AB & Chuinard C. Arthroscopic Bristow procedure for anterior instability in shoulders with a stretched or deficient capsule: the “belt-and-suspenders” operative technique and preliminary results. Arthroscopy. 2007; 23:593–601. 2. Boileau P, Villalba M, Héry JY, Balg F, Ahrens P & Neyton L. Risk factors for recurrence of shoulder instability after arthroscopic Bankart repair. J Bone Joint Surg Am. 2006; 88:1755–1763. 3. Burkhart SS, De Beer JF, Barth JRH, Criswell T, Roberts C & Richards DP. Results of modified Latarjet reconstruction in patients with anteroinferior instability and significant bone loss. Arthroscopy. 2007; 23:1033-1041. 4. Collin P, Rochcongar P & Thomazeau H. [Treatment of chronic anterior shoulder instability using a coracoid bone block (Latarjet procedure): 74 cases]. Rev Chir Orthop Reparatrice Appar Mot. 2007; 93:126-132. 5. Di Giacomo GD, Costantini A, de Gasperis N, De Vita A, Lin BK, Francone M, et al. Coracoid bone graft osteolysis after Latarjet procedure: A comparison study between two screws standard technique vs mini-plate fixation. Int J Shoulder Surg. 2013; 7:1-6. 6. Douoguih WA, Panchal A, Osbahr D & Parks B. Conjoined tendon transfer vs modified Bristow in a glenoid bone loss model: A biomechanical study. Arthroscopy. 2013; 29:e5-e6. 7. Edwards TB & Walch G. The Latarjet procedure for recurrent anterior shoulder instability: rationale and technique. Oper Tech Sports Med. 2002; 10:25-32. 8. Garcia JC, Garcia JPM, Mattos CA & Zabeu JLA. Arthroscopic Bristow-Latarjet-Like procedure: Surgical technique. Tech Shoulder Elbow Surg. 2009; 10:94-98. 9. Ghodadra N, Gupta A, Romeo AA, Bach BR, Verma N, Shewman E et al. Normalization of glenohumeral articular contact pressures after Latarjet or iliac crest bone-grafting. J Bone Joint Surg Am. 2010; 92:1478-1489. 10. Griesser MJ, Harris JD, McCoy BW, Hussain WM, Jones MH, Bishop JY et al. Complications and re-operations after Bristow-Latarjet shoulder stabilization: A systematic review. J Shoulder Elbow Surg. 2013; 22:286-292. 11. Helfet AJ. Coracoid transplantation for recurring dislocation of the shoulder. J Bone Joint Surg Br. 1958; 40:198–202. 12. Hovelius L, Sandstrom B, Olofsson A, Svensson O & Rahme H. The effect of capsular repair, bone block healing, and position on the results of the Bristow-Latarjet procedure (study III): Long-term follow-up in 319 shoulders. J Shoulder Elbow Surg. 2012; 21:647-660. 14. Lafosse L, Lejeune E, Bouchard A, Kakuda C, Gobezie R & Kochhar T. The arthroscopic Latarjet procedure for treatment of anterior shoulder instability. Arthroscopy. 2007; 23:1242e1–1242e5. 15. Latarjet M. [Treatment of recurrent dislocation of the shoulder]. Lyon Chir. 1954; 49:994–997. 16. Lippitt SB, Vanderhooft JE, Harris SL, Sidles JA, Harryman DT 2nd & Matsen FA 3rd. Glenohumeral stability from concavity-compression: A quantitative analysis. J Shoulder Elbow Surg. 1993; 2:27-35. 17. Nourissat G, Nedellec G, O’Sullivan NA, Debet-Mejean A, Dumontier C, Sautet et al. Mini-open arthroscopically assisted Bristow-Latarjet procedure for the treatment of patients with anterior shoulder instability: A cadaver study. Arthroscopy. 2006; 22:1113–1118. 18. Page CM & Bristow WR. The treatment of fractures and dislocations in general practice, 3rd ed. Oxford, Oxford Medical Publications; 1929. 19. Patte D, Bernageau J, Rodineau, J & Gardes J. Unstable painful shoulders. Rev Chir Orthop. 1979; 66:157–165. 20. Peacock JL & Peacock PJ. Sample size for comparative studies: Means. In: Peacock JL, Peacock PJ, editors. Oxford handbook of medical statistics, 3rd ed.Oxford: Oxford University Press; 2011; Kindle ed. position 1459-1508. 21. Pollock SJ. When to stop a clinical trial. BMJ 1992; 305:235-240. 22. Romeo AA, Bach BR & O’Halloran KM. Scoring systems for shoulder conditions. Am J Sports Med. 1996; 24:472-476. 23. Samilson R & Prieto V. Dislocation arthropathy of the shoulder. J Bone Joint Surg Am. 1983; 65:456-460. 24. Streiner D & Geddes J. Intention to treat analysis in clinical trials when there are missing data. Evid Based Ment Health. 2001; 4:70-71. 25. Thomas PR, Parks BG & Douoguih WA. Anterior shoulder instability with Bristow procedure versus conjoined tendon transfer alone in a simple soft-tissue model. Arthroscopy. 2010; 26:1189-1194. 26. Walsh G & Boileau P. Latarjet-Bristow procedure for recurrent anterior instability. Tech Shoulder Elbow Surg. 2000; 1:256-261. 27. Yamamoto N, Itoi E, Abe H, Minagawa H, Seki N, Shimada Y et al. Contact between the glenoid and the humeral head in abduction, external rotation, and horizontal extension: a new concept of glenoid track. J Shoulder Elbow Surg. 2007; 16:649–656. 29. Young A, Baba M, Neyton L, Godeneche A & Walsh G. Coracoid graft dimensions after harvesting for the open Latarjet procedure. J Shoulder Elbow Surg. 2013; 22:485-488. How to Cite this article: JC Garcia Jr. Arthroscopic Bristow – Latarjet Procedure: Results and Technique after nine-year experience. Acta of Shoulder and Elbow Surgery Oct – Dec 2016;1(1):27-34.
https://i1.wp.com/asesjournal.com/wp-content/uploads/2016/10/Jose-Carlos.png?fit=389%2C398 398 389 ASESADMIN2016 http://asesjournal.com/wp-content/uploads/2017/09/banner-favicon.png ASESADMIN20162016-10-10 20:42:052016-10-20 13:00:26Arthroscopic Bristow - Latarjet Procedure: Results and Technique after nine-year experience.